[Pete Mills] recently bought the all-new Ford Fiesta, which offers impressive fuel economy over that of his Jeep. He soon figured out that he has real time access to a wealth of engine and chassis data through Ford’s OpenXC platform and used it to build blueShift, a neopixel tachometer. The car already has a tach, but this one is more visual, can be seen in periphery, and is just plain fun. In case you hadn’t heard, the OpenXC platform is Ford’s consumer key to the kingdom of OBD2 treasures. It unlocks the magic through its Vehicle Interface, which plugs into the OBD2 port and translates the CAN bus messages to OpenXC format. These messages are packaged into JSON format and can be sent over Bluetooth or Ethernet/Wi-Fi to an Android, Python, or iOS device. [Pete] went with Bluetooth and used a BlueSMiRF with an Arduino Pro Mini. He derives power from the car’s on-board USB port, but has future plans to use the OpenXC VI port. blueShift reads the RPM data and displays a green trail as the engine revs up. At the peak revolution, it shows a red LED. This one is sticky and will persist for the lesser of three seconds or the time elapsed to a new positive RPM. [Pete] is also reading the headlight status of the car. As soon as they come on, the RGB LEDs dim to avoid blinding him at night. [Pete] wanted to make an enclosure more finished-looking than a Tupperware box. He nearly detoured into 3D-printer design, but ended up putting together a Prusa i3v and came up with this RAM mount-compatible enclosure. His fantastic write-up and code are on his blog, but you can make the jump to see a short demo and a full explanation video. 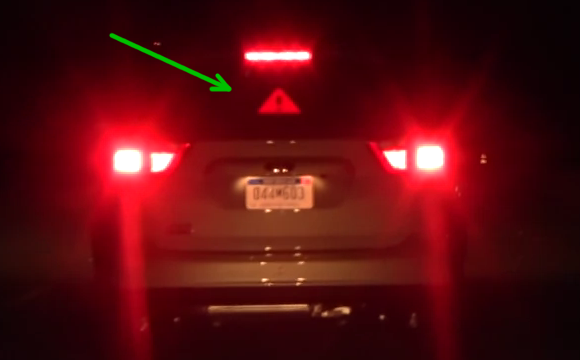 You can also make smart brake lights or even create art with OpenXC. In this video, [Joe Grand] takes us through [Team Van Gogh’s] entry in the OpenXC hackathon event. In what could possibly be the greatest road trip in history, [Joe Grand, Ben Krasnow, TechNinja, and Super Awesome Sylvia] all pile into a car. With them they bring a host of dev boards, wires, a CB Radio, and of course Sylvia’s WaterColorBot. As their name implies, [Team Van Gogh] took a more artistic approach to the challenge than other teams. OpenXC steering, gear shift, accelerator and brake data is sent through a ChipKit to an RS-232 link into [TechNinja’s] laptop. The laptop translates the data into commands for the WaterColorBot. With this system, a simple Sunday drive can become abstract art. The team also showed the concept of what could be done if OpenXC was extended to send data back to the vehicle – something Ford doesn’t support. Their example works when a phone call comes in by using the system to lower the volume on a CB radio standing in for car’s Bluetooth system. Most of this challenge was completed with simulated data from the OpenXC vehicle interface. The team only had a few minutes to work the bugs out in a real vehicle. However, they proved their concepts well enough to win the grand prize. At a recent hack-a-thon event, [Al Linke] tapped into a vehicle’s OBD port with an OpenXC vehicle interface and hacked an LED screen in the rear window to display data based on events. If you haven’t heard of OpenXC, you can expect to read more about it here at Hackaday in the near future. For now, all you need to know is that OpenXC is Ford’s open source API for real-time data from your vehicle: specifically 2010 and newer model Ford vehicles (for now). [Al] connected the OpenXC interface to his Android phone over Bluetooth, transmitting data from the OBD port to the phone in real time. From here, the Android can do some really cool stuff. It can use text to speech to announce how much your lead foot cost you, add sound effects for different car events, and even interact with additional devices. Although he managed all of those features, [Al’s] primary goal was to add an LED screen that displayed messages on the vehicle’s back window. When the phone detected a braking event from the car, it directed the LEDs to light up with a “braking” image, adding some flavor to the process of stopping. He could also change the image to a “Thank You” sign with a waving hand, or—for less courteous drivers—an “F U” image with a slightly different hand gesture. You’ll want to check your local and/or national laws before attempting to strap any additional lighting to your vehicle, but you can watch [Al’s] car light up in the video below. For a more detailed look under the hood, he’s also provided an Instructables page. If OpenXC catches on, the number of vehicle hacks such as the Remote Controlled Car may skyrocket.